So after getting back into surfing 2 years ago after a 10 yr hiatus (kids, wife, major injury) i have become increasingly addicted to buying new surfboards. What started out as a massive learning curve and realisation of how much things had changed since id hit the water 10 years ago (boards, wetties etc) has now become a full on addiction. Is there some kind of help group like surfboards anonymous? My quiver is not large by any means compared to others with only 4 in the rack however if i had kept all purchased other than trade in id have 6. In just 2 years! Part of it is still dialing in my preferred board size and needing different boards for different conditions, you know how it is, but part of it is just the stoke of buying a new board. Next thing you know i’ll be ordering customs, but could i wait that long for a board?? Does anybody else suffer this affliction? Webster Spartan coming up. 7’6 x 19 3/4 x 2 7/8. For knifing the takeoff more than gliding in. Large but not ‘big’ waves. The spartan has a beautiful outline, and I reckon it'll surf that purpose quite well. How much does a Webster of that length set you back? On a tube/good wave board around 7’0” long. I’m sure they’ve been discussed on here before. Had a 6'6" 2+1 and it was great. It was a bit too narrow for me at the time so it hardly saw the kind of waves I bought it for, but the fin set up was a bit of a revelation. Most memorable surfs were in fast, down the line waves with no time for turns. Loved the single fin feel but with the added safety net of knowing I had a couple side fins there to save me at the last moment. Not much, Dan. 5 x futures and 4/6 + 4/6 glass, $900. I think it’s a fricken bargain. What's the latest with the Dave Parmenter shaping experience down under? Did his last board the other day I think. "Got a 8'0 Gash gun with a 2+1 and a 7'6 six channel 2+1 from Dave Parmenter...both are excellent...2+1 feel like there is no limit to the top end speed and you can hang it right up there on a high line run...they always feel really stable underfoot"
Fun fact, Simon's first thruster had the bigger fin in the back originally. I think it was sanded down. 2+1! Long wait for boards out of Mona Vale. Must be a few addicts out there. This might be a slight derail, but have a few brands reduced their prices in the last year or two? JR were $800+ now $625-$675, Emery from $880 to $780. These are website prices btw. I think I've seen this at a few other places too. Competition or found a way to reduce costs, overheads? Rodney Dahlberg's evil twin Dhalberg? Yep...Board Decals have correct spelling. I actually saw that I reckon it was at least over a month ago. I'm very surprised they haven't corrected it by now. 6 is nothing mate, no where near an obsession, don't be too hard on yourself. That's just a regulation quiver. when you're up around 30 or 40 then you can start to panic. I can tell you a story about a guy who keeps his quiver squared off at 200. More collection than quiver really, though he surfs a surprising number of them. Even more surprising is his wife is totally cool with it. And no, it's not me. Can you give us an idea of the guy's 200 board inventory? At that number it's no longer a quiver. There must be some good stories behind those boards. At the risk of sounding wanky, Damo is more a curator of design than a collector. 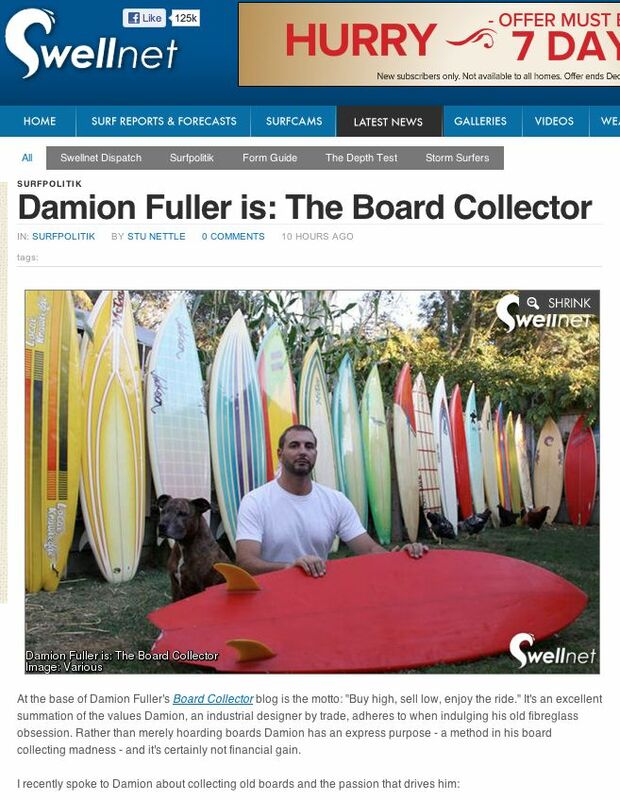 If there was a surfboard museum where each piece required explanation about how it fitted into the design continuum, then he'd be the guy with the flat cap and poker. Hard to stocktake it, but he's got, not one first gen Energy Thruster, but about 5 or 6, lotta Bolts, McCoy Zaps, Lance Collins Wave Tools, couple of Bertlemans, couple of Schroffs - Damo loves his twinnies - and bits and pieces from every shaper of repute between about '75 and '85. He's particular about collecting for that period, which he calls the T2 - the second innovation period. Really nice kit behind him, Stu. Great to have people so passionate about preserving examples from key epochs in surfing history. Even his chooks are getting up close and personal!!! By the way, did Damo end up getting a Stussy? Yeah, from memory he's got one now. Also, for a while there he was not only acquiring and admiring key boards but recreating them too...well, recreating them as best he could. He built a little A-frame shaping bay out the back of his house and mowed the foam in there. All of which made his quiver that bit larger again. nice chooks too- silver laced wyandottes. Yeah. I think i need a board with a little more nose rocker. Got the word late last night..."Yep your board is ready"
Ordered a new one today. Got my autumn/winter special today. Looks the goods. Simon 6'4" NXFC slightly customised. Just about ordered a Gary McNeill entity pin for a step up.